We live in an age where companies are driven by gathering and processing copious amounts of data. Every interaction requires you to answer questions, divulge more information, or complete a long list of tasks to achieve a desired outcome. What if we simplify the process, and all you need to do is enter information once and press a button? The changing landscape of how we communicate, process information, and work is creating a positively disruptive environment that drives business agility and transformation. Smart, progressive companies have embraced technology to make customer experience their priority, developing digital solutions to make each task quick and easy. In essence, this involves creating a positive customer experience based on solving a problem and fulfilling a need. This approach has seen considerable growth in automation through cloud computing services and workflow management software. What makes one solution better than another? In many cases, it comes down to ease of use and quality of outcomes. At TIMG, our focus is always on our customers. Our information management systems have been developed to make our clients' jobs less stressful and complicated. We use technology to solve problems rather than add to them. Our user-friendly file management software allows clients easy tracking of and access to their complete online inventory. Automation of data backup and disaster recovery limits the need for customer involvement, and provides reliable protection against loss. Meanwhile, other tailored digital solutions seek to enhance productivity by saving time on content-driven tasks and provide real-time information to enhance decision-making. As the father of the automobile industry, Henry Ford literally set the wheels in motion that led towards our modern society, one that desires greater automation to achieve tasks in our everyday lives. I don’t doubt that Mr Ford considered the consumer experience to be paramount when he designed his first car. The rest, as they say, is history. If you’re not satisfied with your customer experience, the TIMG team would welcome the opportunity to learn more about your business. To arrange a complimentary review of your information management systems, contact us at sales@timg.com. Without realising it, we mentally adopt a workflow process whenever we undertake activities in our everyday lives, even relatively simple tasks such as planning a night out or organising an overseas holiday. If we’re lucky, the process runs smoothly. But often there are bumps along the way, challenging us to adapt in order to achieve our goal. Rules-driven Workflow: Implemented based on a sequential workflow, in which rules dictate the progress of the workflow. Travel: a workflow which manages a client vacation, hotel reservation, flight reservation, etc. for a travel agency. Start with an understanding of your end goal. List key stakeholders (people / departments / suppliers involved in the activity). Map out a chart showing core tasks and activities. Add “swim lanes” showing shared responsibilities or crossovers with other departments / personnel / suppliers. Batch similar tasks together to streamline activities and achieve higher productivity. Anticipate conditions or occurrences that may impact on the workflow. Build in “work-arounds” (bypasses) to overcome expected complications. Include a central communication point to allow easy access and sharing, e.g. an Enterprise Content Management (ECM) system or file server, to host digital documents and files. Go paperless: use digital workflow charts to enable easy updating and sharing. Revise workflows regularly to manage change and remain relevant. Higher productivity – less time spent on manual tasks. Visibility – aids managers to view business critical processes in real-time. Adaptability – allows fast response time to react to changes and modify processes. Improves Accountability – creates productivity measurement and continual process improvement. We all hate filling out forms. It’s a thankless and repetitive task that often involves inputting the same data over and over again. There had to be a smarter way, so the team from TIMG eBusiness went about creating it. Of course, where better to test it than on our own Employee Leave system? With over 350 employees, TIMG has numerous leave forms to process every day. By using the TIMG PaperLite solution, our eBusiness Team developed an electronic employee leave form pre-popluated with existing personnel information. These forms could then be automatically processed and integrated with TIMG’s payroll and accounting systems to provide real-time data updates on leave status and accrued leave for each employee. up-to-date and accurate leave status information. You don’t have to be a large organisation to benefit: any business can make significant gains in productivity by using TIMG's PaperLite. Currently, TIMG is working with the medical industry to develop pre-populated forms that integrate with patient information, giving doctors back time to spend on delivering medical care rather than filling out forms. To learn how TIMG can help you improve your workflow and remove the drudgery from mundane and repetitive tasks, contact the TIMG eBusiness Team at ebusiness@timg.com. 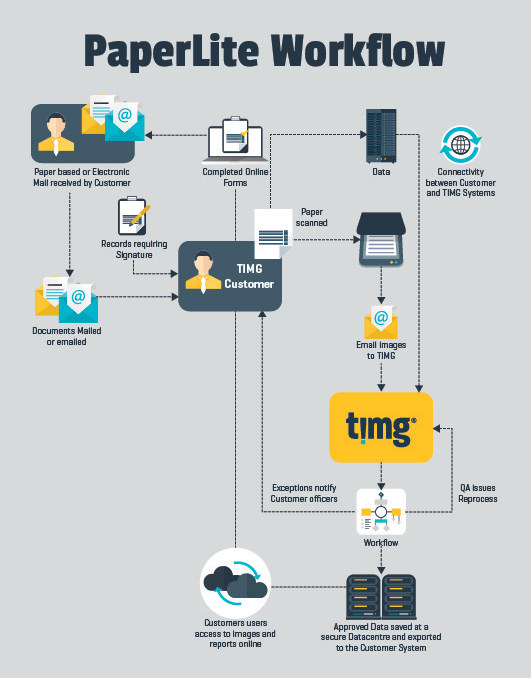 Below: This flowchart shows how the TIMG PaperLite solution works to assist our HR Department process leave forms. The legal and financial industries have long been huge consumers of paper, producing documents like contracts, financial reports, impact statements, feasibility studies and marketing collateral, to name just a few. In many cases, the work of preparing and printing these documents needs to be completed yesterday. Understanding this demanding market has been the key to the success and growth of Confidential Document Solutions (CDS). Founding members Michael Wrobel and brothers Tim and Malcolm Hall began the business in Brisbane in 2008, filling a niche in the market by providing a 24/7 customised digital print, photocopying, and scanning service. With dedication, hard work and specialist expertise, CDS captured a significant market niche, servicing primarily the legal and resource industries. “While it was a challenge in the beginning, our perseverance paid off. We were on call 24/7, working in shifts and responding to calls within minutes. Other printers knocked off at 5pm, many refusing to even take calls, never mind starting a job. We knew we had to be different. Our knowledge of the legal industry gave us a competitive edge. Our commitment to quality service, quick response times and professionalism is how we succeeded. Now with the help of LitSupport and TIMG, we can grow and expand our services into new markets,” said Managing Director Tim Hall. Critical to the company’s success is its commitment to quality. CDS uses a sophisticated software program to log and track all jobs, thereby ensuring accountability and industry compliance. All work is completed with a high attention to detail and adherence to security and data privacy. 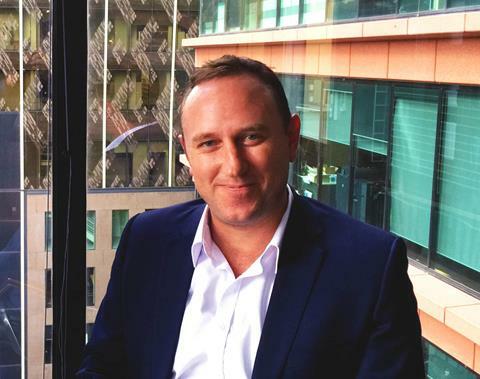 Today, CDS is consolidating its resources with LitSupport, combining offices in Brisbane and improving infrastructure in their Melbourne and Sydney offices to handle high-end commercial work from Victoria and NSW. However, technology can provide revolutionary administrative efficiencies, while releasing resources to provide better quality health care. TIMG is set to deliver significant time savings and cost benefits through a customised digital workflow management solution developed specifically for healthcare professionals. TIMG’s tailored solution - called PaperLite MD - enables healthcare professionals to devote more of time to caring for their patients and less to completing administrative forms and managing data. 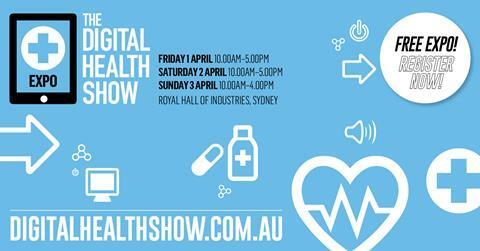 To learn more about how TIMG can improve productivity, visit the TIMG eBusiness team at the Digital Health Show in Sydney, from 1 to 3 April. The Digital Health Show will host an exciting array of international and national keynote speakers highlighting global advances in smart digital technology to improve efficiencies in the healthcare industry. Did you know that 31 March is World Backup Day? Take the pledge and backup your data. Christabel lives in Tasmania surrounded by beautiful scenery, friendly people, and delicious local produce. Up until now, the State has had steady growth. But that is about to change. The Tasmanian Government’s commitment to invest in technology and innovation will undoubtedly encourage strong economic growth and confidence in the business sector. TIMG is proud to be part of this movement by providing a one-stop shop for information management and by leading innovation through smart eBusiness solutions. “I spend most of my days meeting clients and discussing the challenges they face in their business. This is an exciting time for the community as we focus on future growth through technology. We see enormous opportunities to help improve workflow processes and to remove some of the repetitive time-consuming tasks for businesses. By using technology, we can help them work smarter, save time and improve performance and security,” said Christabel. Together with a hard-working team, Christabel has forged strong relationships with local community and business groups to grow opportunities for TIMG. Christabel joined TIMG in 2008 as a Service Representative, before progressing to Senior Service Representative. Christabel was selected to be part of TIMG’s Future Leaders Programme, involving comprehensive training in all business and product areas. Her dedication and achievements were recognised when she was awarded the position of Branch Manager for Tasmania in 2014. With a background in hospitality, Christabel understands the importance of building good relations and keeping customers happy. She enjoys meeting community groups and takes an active role in Rotary and fund raising activities. If you would like to discuss ways to improve your business performance through smart innovative solutions, contact Christabel Kuypers or your local TIMG representative on 1300 764 954. Contact your local TIMG office on 1300 764 954 for a complimentary review of your information management systems. While every effort has been made by TIMG to ensure that the information contained in this newsletter is up to date and accurate, TIMG does not give any guarantees, undertakings or warranties in relation to the accuracy completeness and up to date status of the above information. TIMG will not be liable for any loss or damage suffered by any person arising out of the reliance of any information in this newsletter.